0 Comments Posted by Alyssa Noonan in Search Engine Optimization - SEO on Tuesday, March 26th, 2019. Search engine optimization (SEO) is so important in today’s online world. Reaching your potential new clients can be challenging at times, but good SEO practice can ease that frustration. 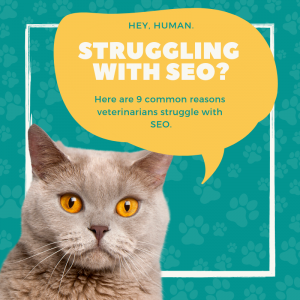 We’ve highlighted some of the most common mistakes veterinarians make when entering the realm of search optimization. Use this as a guide to learn how to make the most out of your SEO experience. Invest in an agency that specializes in SEO for veterinarians. It’s easy to find a company that will offer you a low rate for a quick SEO makeover, but that won’t serve you in the long term. SEO is not a one-time cost; it’s a process that evolves over time. A good SEO agency will take their time getting to know you and your practice to better understand your clientele. They will track progress to see what works best for you. Investing in search visibility is an investment in your practice. We aren’t mind readers, but SEO tracking helps with that. One of the best parts about search engine optimization is keyword tracking. Patterns in search queries can help us understand what will most likely be searched in the future, and how you can use that to your advantage. We may find that people in your area often search for pet grooming, and we can use that to optimize your website so they can find that service easily. Understanding what the user wants and needs will help you get more website traffic, and potentially more clients. Sometimes, your audience may face challenges that we may be unaware of. This can range from technical difficulties, like load time or a page error, to content clarity. Perhaps a question may be best answered with photos or video, or the text font may need to be easier to read. These are things that sometimes get overlooked but are easily fixed. An SEO specialist can quickly and efficiently address issues like these so that all you have to focus on is your business. Some vets will try to cast a wide net in order to get the most people to visit their website. While that ambition is great, it may ultimately be ineffective. Thinking of what people need in your area may be more beneficial for your business rather than competing with large corporations on a major scale. Certain pages and their well-known reputation will give them dominance over search results, and they will most likely come up first on the page. Being more specific and competing locally will give you a better chance of seeing a high return on investment. Following trends in your industry and making sure the content on your website is fresh will keep you on top of potential business opportunities. Updating content is important because it not only educates your readers, but it also legitimizes you as a resource for reliable information. Additionally, optimizing this content will help your overall search engine result success. For example, pet owners should be aware that regions that experienced a mild, wet winter will likely see an increase in the tick population this year. The Centers for Disease Control and Prevention urges pet owners to speak to their vets about the best tick-prevention products. Most search queries happen on mobile devices. This can drastically change how your website is seen and experienced. Little things like the size of photos, to the layout of the page can occur differently if accessed through a mobile device rather than a traditional screen. An SEO agency will be able to find the best design that will make both you and your clients happy. One of the most amazing things to ever happen to small businesses is social media. Through friend recommendations, checking in at locations, and sharing content, people can find your business organically through their own social communities. Making sure that you have a strong social media presence and that you post quality content could make a huge difference. Everybody loves cute animals! Pairing informative or relevant content with high-quality photos is perfect for vets. Animals are such shareable content, so use that to your advantage. If you want to go the extra mile, you can hire a professional photographer to make your business stand out and highlight what makes you unique. Sometimes questions are best answered when heard straight from the horse’s mouth (pun intended). Featuring video is a great way to show and tell your business as well as add a personal touch to your content. This can help add a face to the company and connect with your audience in a more relatable way.